Wondering which companies should be core holdings in your portfolio—and which may be on their way out? Patrick Watson and Robert Ross expose the answers in two revealing special reports from their premium research service, Macro Growth & Income Alert. Their illuminating predictions come courtesy of the Equity Evaluation System (EES), Macro Growth & Income Alert’s proprietary modeling method. The EES uses more than 100 different financial metrics to identify the companies that offer the most value. You don’t want to miss these proven insights into where the stock market’s headed. 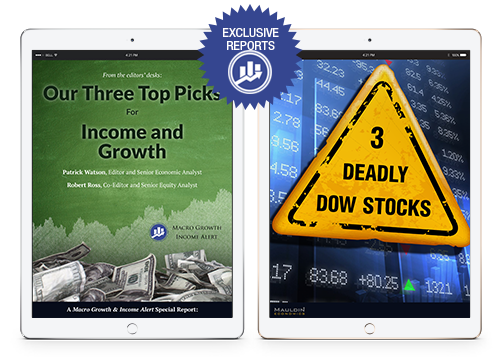 Download Three Deadly Dow Stocks and Three Top Picks for Income & Growth­—a special bundled series of exclusive reports—for free now. Simply enter your email address below to claim this offer. Which iconic brand made the deadly list (and what Warren Buffet has to do with it). The energy giant Watson & Ross predict has a rocky road ahead. Which industry stronghold may soon be taken down by a digital upstart. What sector geopolitical events point to as offering the most sustainable competitive advantage. Which company has one of the strongest—if not the strongest—business models in Watson & Ross’s portfolio. Both reports are yours free—there are no strings attached and nothing to buy when you request them today. Don’t miss your chance to discover which stocks are primed to climb and which may be setting up to sour. Copyright © 2017 Mauldin Economics. All Rights Reserved. Where do you want us to send these reports?